The Fabrication & Manufacturing Division has the expertise to design, build, manufacture, control and coat/paint air conditioning and heating products for the commercial and industrial industries. In addition, this division also provides fabrication, electrical, and coating modifications to existing equipment. 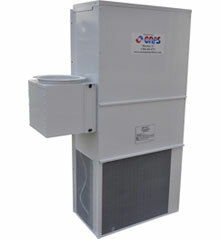 CAPS offers the ability to custom manufacture various types of HVAC equipment to meet your needs. These include, but are not limited to,: Air Handling Units – DX or Chilled Water, Custom Designed Package Units, MCC & Switchgear HVAC, and Chemical Filtration Scrubbers. Our durable and well-crafted wall mount units are not only designed to endure harsh conditions, but are also designed for easy maintenance and quiet operation. Features include: Environmentally “green” R-410A refrigerant, 16 gauge galvanized paint grip cabinet with “corrosion resistant” finish for use in harsh operating environments, Stainless steel cabinet/casing, and many more. CAPS specializes in the custom design, engineering, and manufacturing of explosion-proof HVAC systems including air conditioning, heating, pressurization, and chemical air filtration. Our explosion-proof HVAC units can be designed and constructed for industrial locations both on and offshore. Explosion proof products include: explosion-proof air conditioners, hazardous location air conditioners, flameproof air conditioners, explosion-proof pressurizing systems, gas-phase air filtration units and explosion proof heaters.